SHIPPENVILLE, Pa. – Imagine the look on your sweetheart’s face when showing up for a surprise Deer Creek Winery getaway. Perhaps you’ve hopped in the car and wouldn’t say where you’re going. Maybe you’ve even gone on a long bike ride and promised you’d find a hot tub that night for both of you to relax (we’ve actually seen this before). Did you go so far as to use a blindfold? That would make things interesting! No matter your story, a Deer Creek Winery getaway is the perfect all-in-one package. You get one place for one price to enjoy a nearly endless list of fun activities! Come take a look inside. It’s high time for romance. The only person you want to see on this getaway is your sweetheart. We’re fine with that! Feel free to stay in your room the duration of your stay. Order room service — breakfast, lunch, and dinner. Snuggle up in bed, next to a warm fire, or in one of our hot tubs. 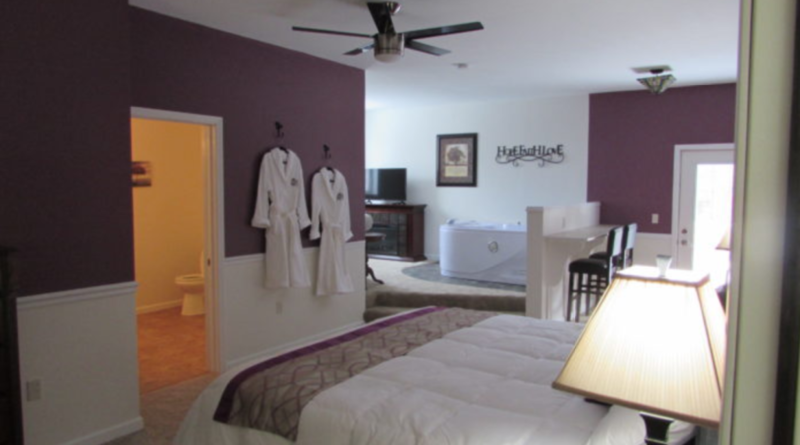 Our small, quaint winery B&B has just 8 guestrooms, beautiful and spacious as they are. So we’re more free to focus our service on you as compared to larger inns and hotel chains, whose resources and staffing can sometimes be stretched while meeting the needs of dozens or hundreds of guests. We’re in the heart of rural Western PA. It’s beautiful here no matter the season (whether it’s 88 degrees and sunny, leaves are falling, spring flowers are springing, or snow is covering our 100 acres). People love all of our rooms, each of which features a unique seasonally or culturally inspired design. Most have in-room hot tubs and all feature fireplaces. But let’s focus on our flagship guestroom, Brooks Deluxe. It’s a suite so stunning that we literally stake our name on it! You’ll love the king bed, fireplace, fireside whirlpool, desk, and outside balcony overlooking our woods and a bird feeder. It features its own refrigerator, coffee maker, microwave, couch, table/chairs, and plush robes. Click here for a look at the room rates. There are so many great musicians in the Clarion, PA area. We’re proud to call many of them our friends. They come back time and again to grace our guests with tunes from a variety of genres. We LOVE being vintners. There’s nothing better than bottling our newest batch and announcing it’ll be available at the main winery and our 6 outlet locations. We have selections for all vinotypes (learn yours here), and they’re all certain to set the mood for your romantic escape. We’ve seen an interesting trend of late. While not completely unexpected, we’ve noticed more men have been booking Deer Creek Winery getaways to share with their sweetheart. We’ve heard wonderful stories from couples and joined in their surprise delight. Now let us delight you. You won’t walk away disappointed.